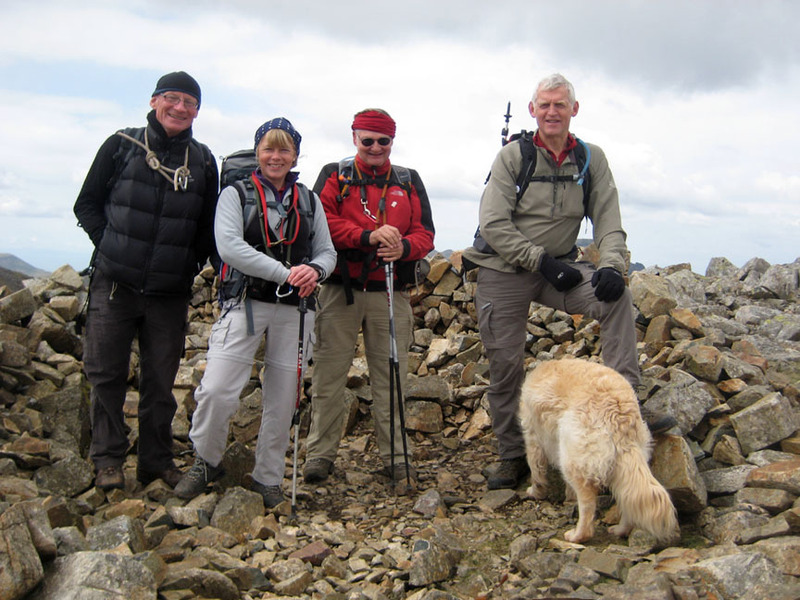 Date & start time: Monday 3rd May 2010, 10.15 am start. 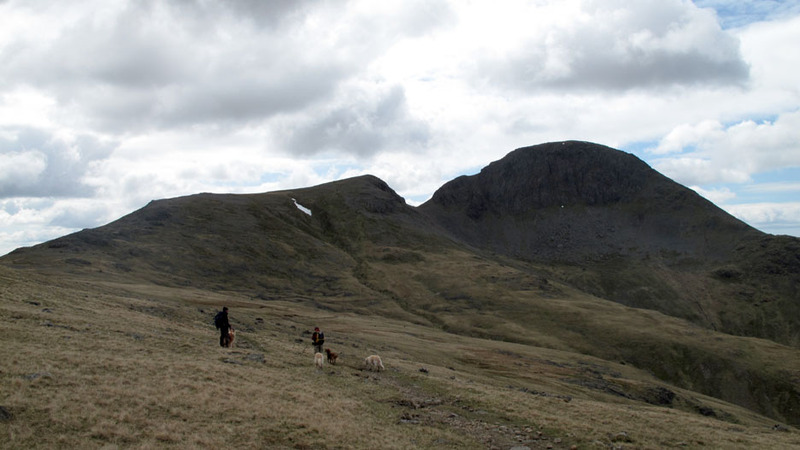 Places visited : The Drum House, Moses Trod, Windy Gap, Green Gable, Brandreth, Grey Knotts, and back to Honister. 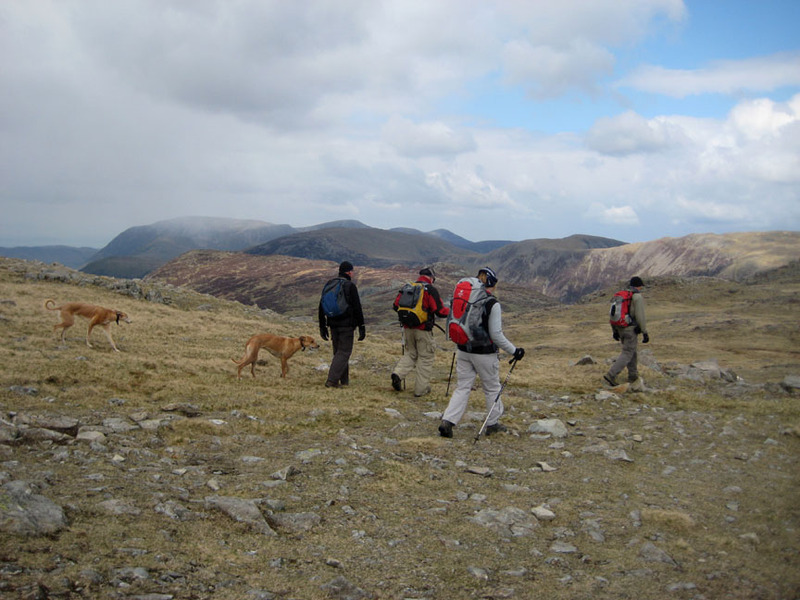 Walk details : 5.3 mls, 1950 ft, 4 hrs 15 mins including lunch. 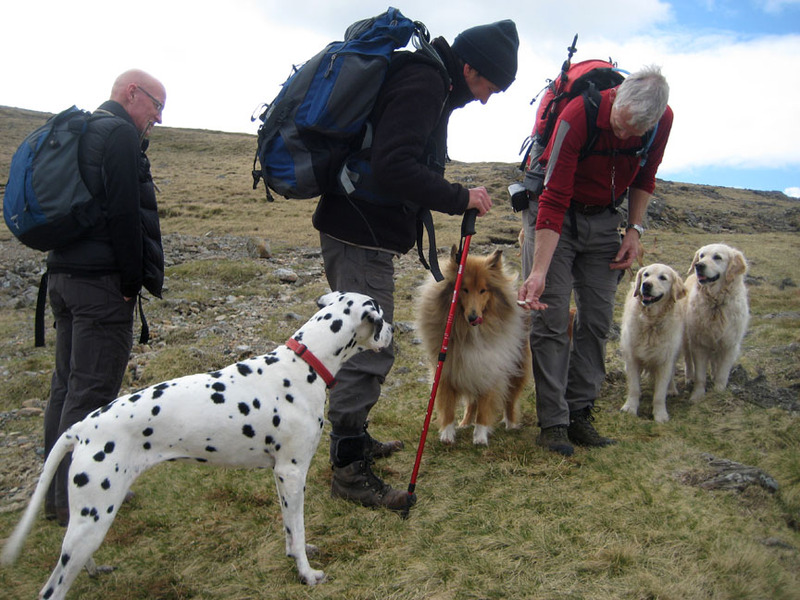 Walked with : Hilton, Jo, John, Ann and the dogs, Susie, Jodie, Amber, Polly, Harry and Bethan. Weather : Blue skies, variable cloud and an occasional cool breeze especially up high. 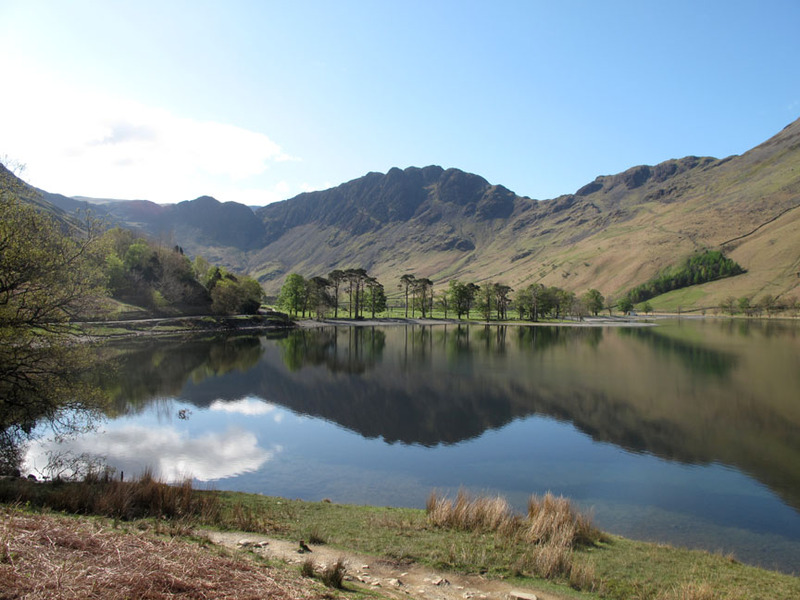 Today we had the best forecast of the Bank Holiday weekend . 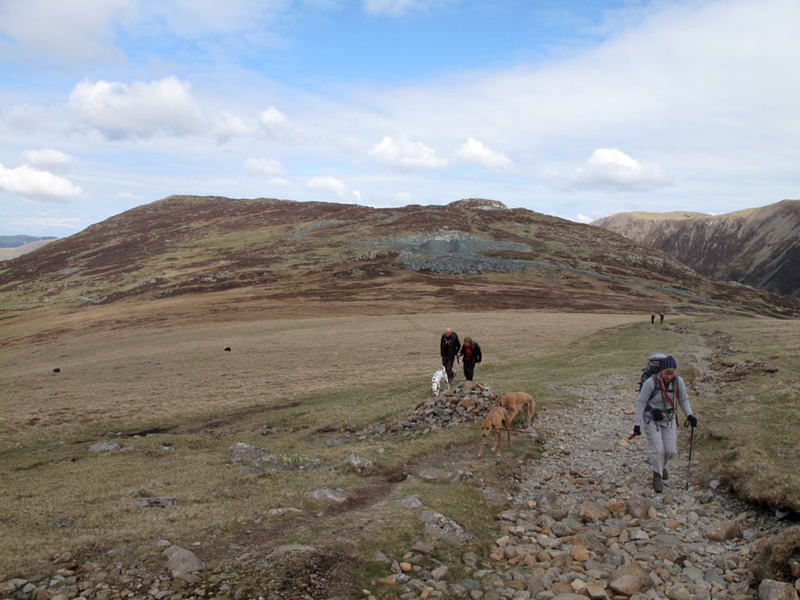 . . so we head for the fells. 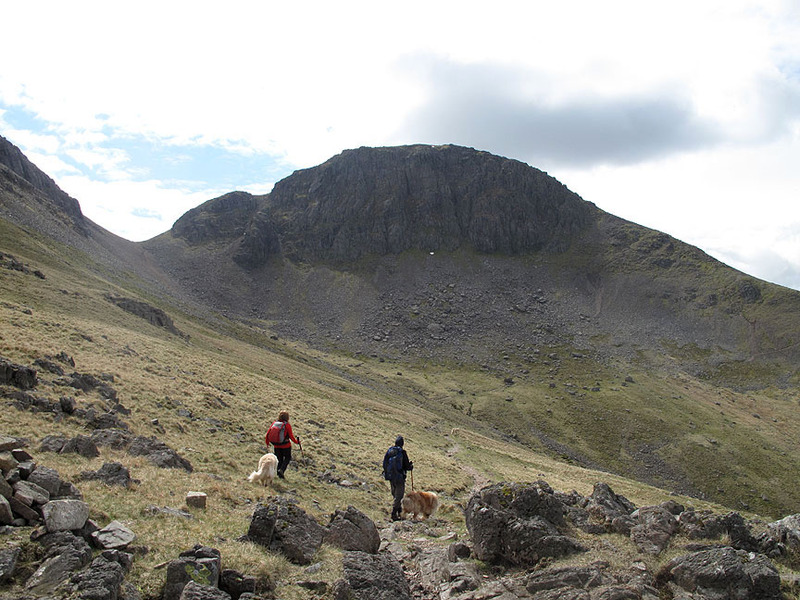 and return over the high tops of Brandreth and Grey Knotts, so here we go ! A new building in the valley ? 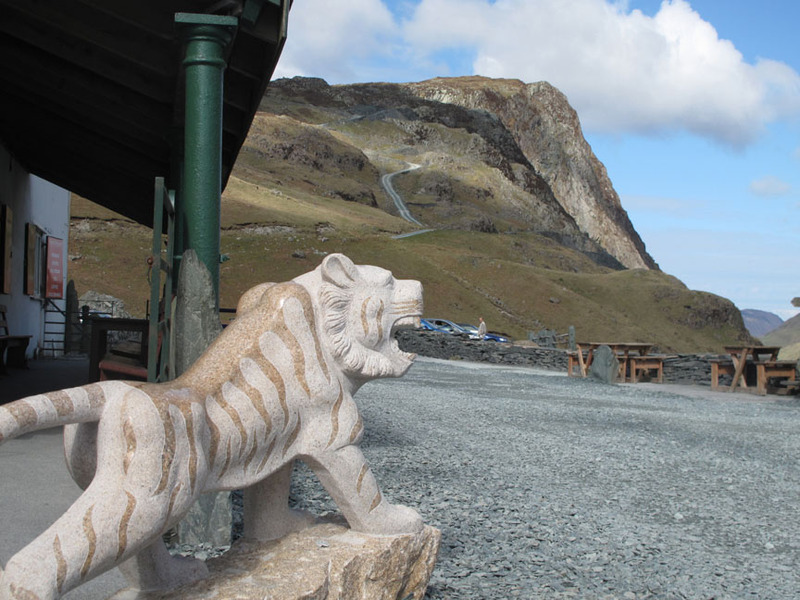 You'll be pleased to learn that Syke Farm has re-built their gift shop and tearooms and will be open for business again shortly. 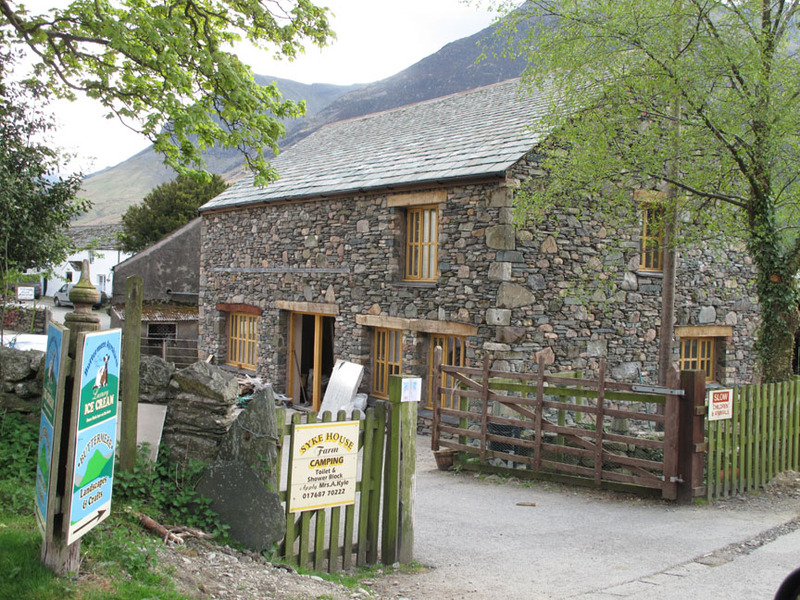 Currently they are selling their excellent Buttermere Ice Creams from a trailer in the farm yard. 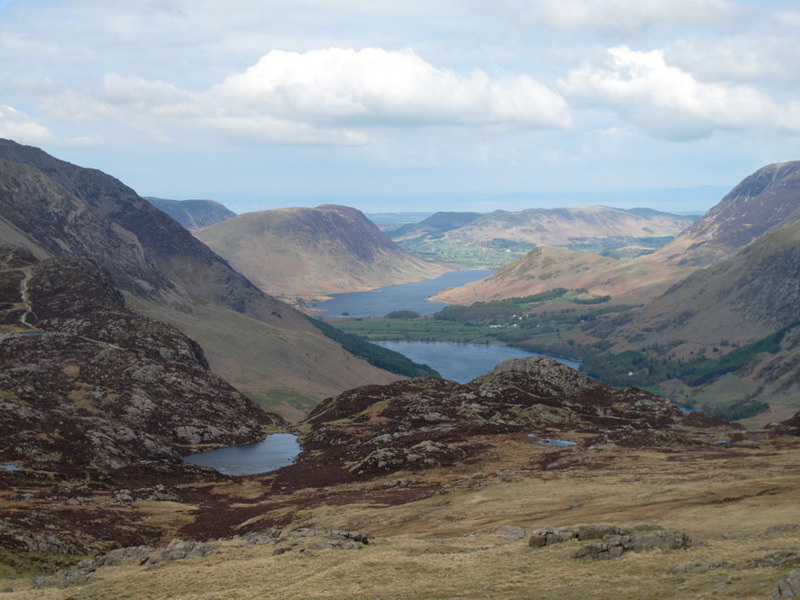 On the way up the valley to meet the others we pass the top end of Buttermere and often stop for a photo. 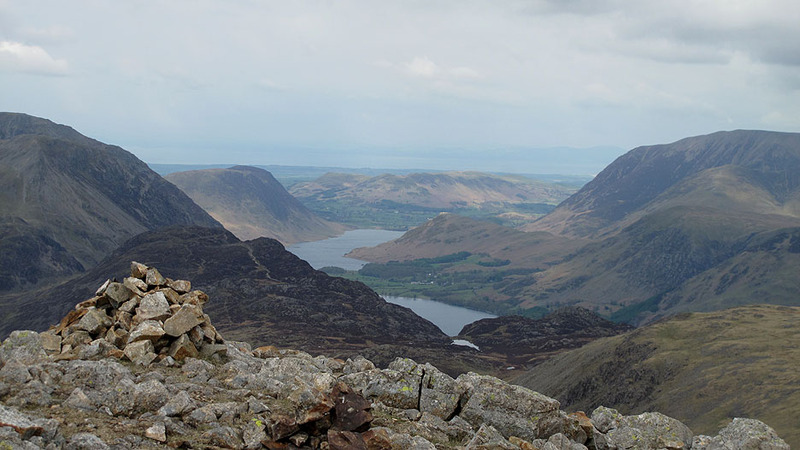 Today I think we saw one of the best views of Haystacks and the pines that we've seen for a long time. Guess where we started the walk . 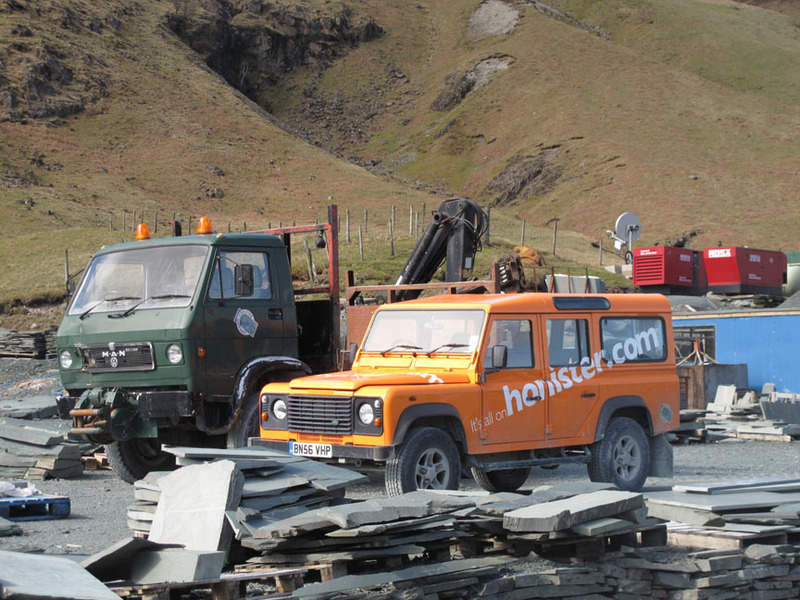 . . the NT car park alongside Honister Mines. as we pass across the front of the shop at the start of the walk. 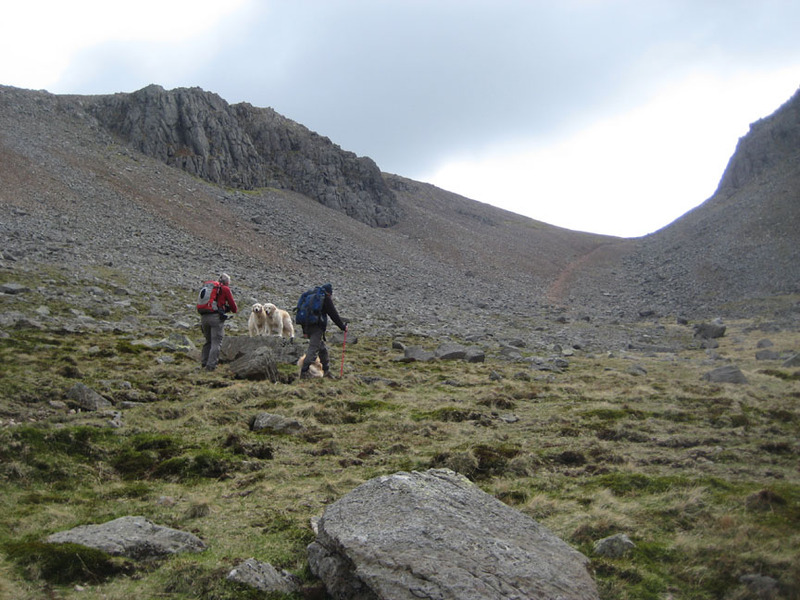 Looking back as we start the climb up onto the Dram Road. The visibility is wonderful and the sky as blue as promised by the morning forecast. 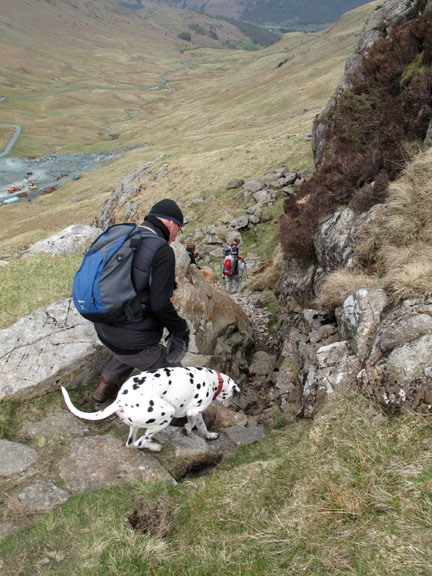 A steady climb finds us at the Drum House at the highest point of the old trackway. 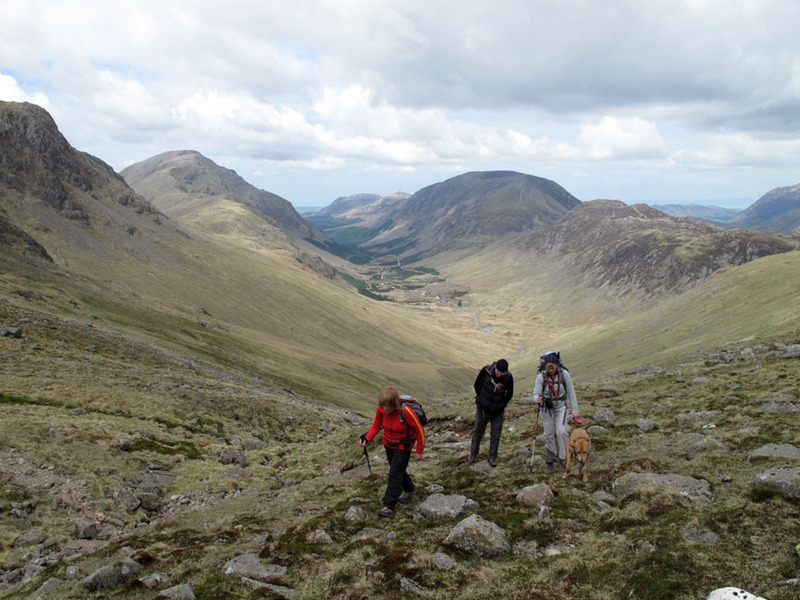 This is our first view of the high Ennerdale Fells and on a day like today it never ceased to get the adrenaline going. 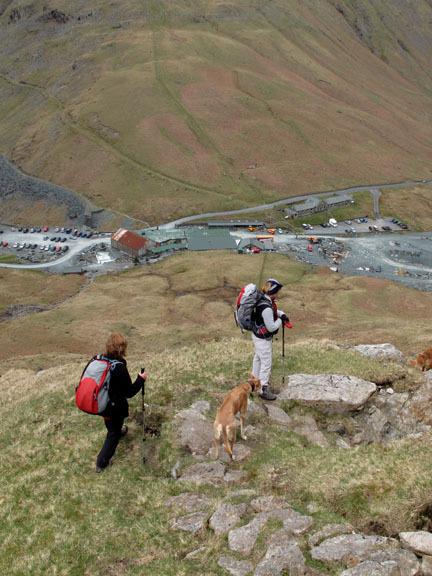 Moses Trod, named after a worker at the old slate mines, is our route to Green Gable. 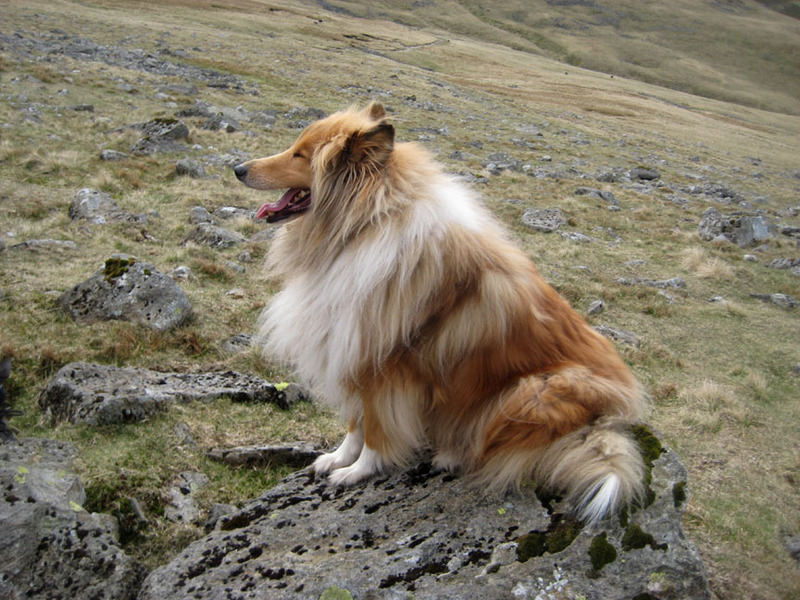 Along the way we meet up with a delightful long haired collie Jake, and his owner Stephen. They are up on holiday from Plymouth, John's second home town after Stoke. 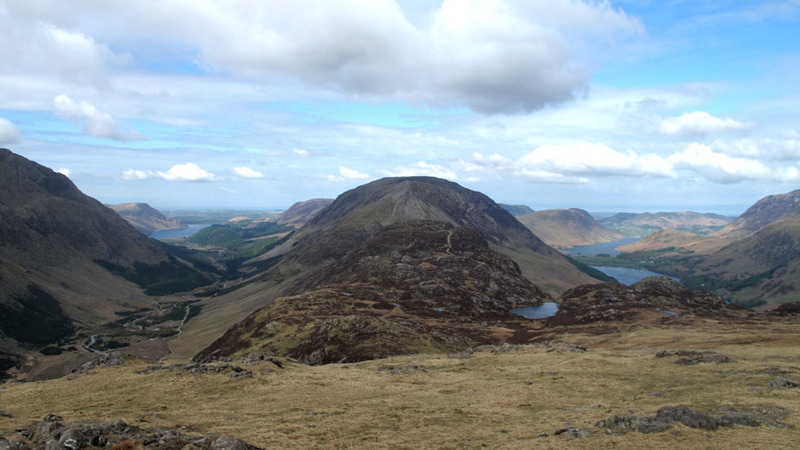 As we make our way along the path the views down Buttermere open out. 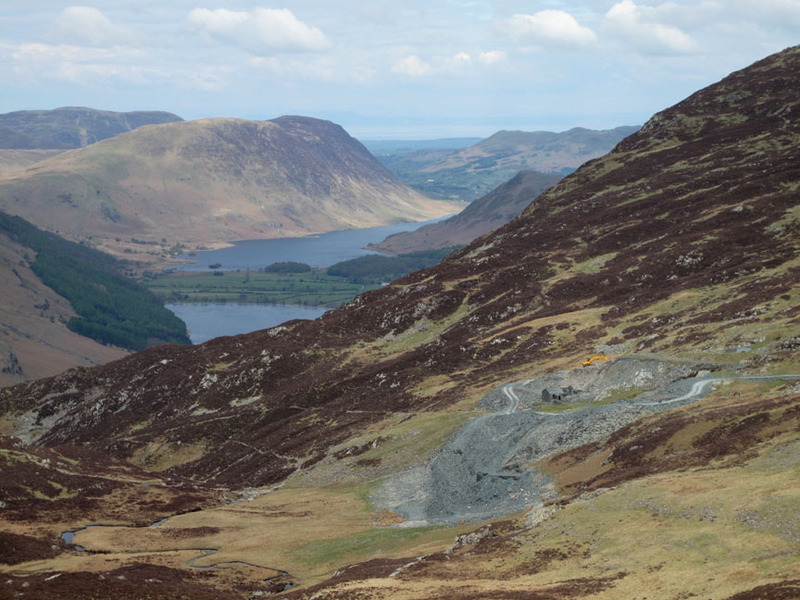 The slate workings are at Dubbs Quarry on the side of Fleetwith Pike. 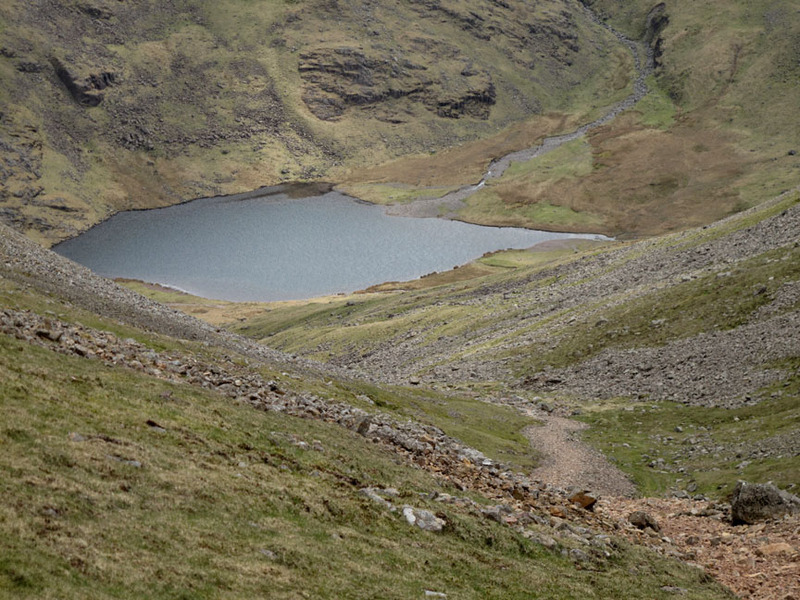 From a point near the top of the rise these three lakes come into alignment. 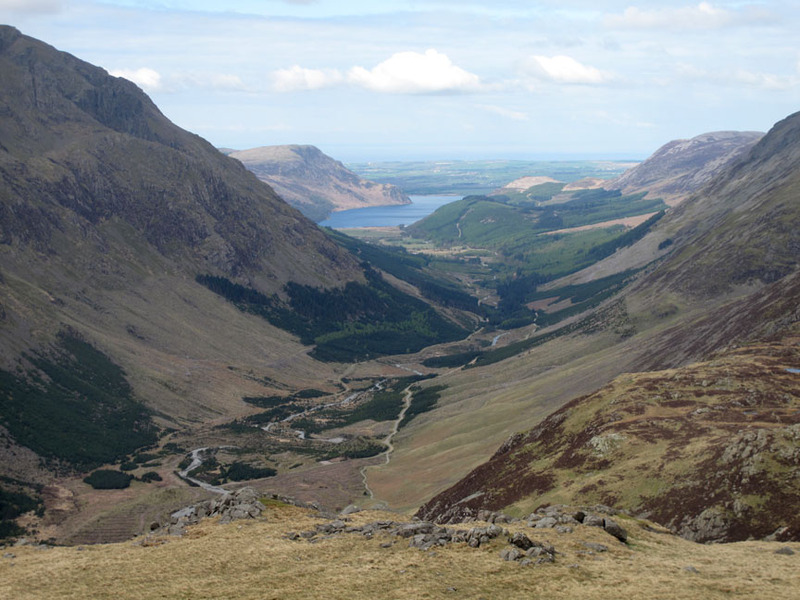 From the Brandreth Fence we get a fine view all the way down Ennerdale. 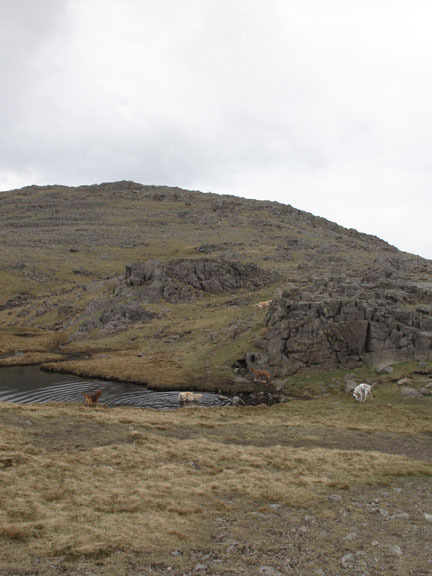 The brighter minor summit on the right hand side at the foot of the lake is Bowness Knott that we climbed recently. 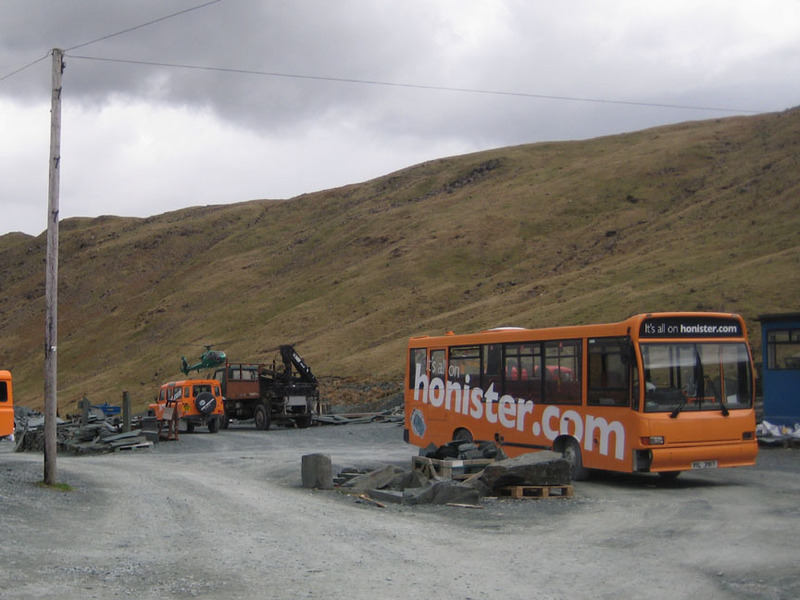 Our two favourite valleys in one photo. 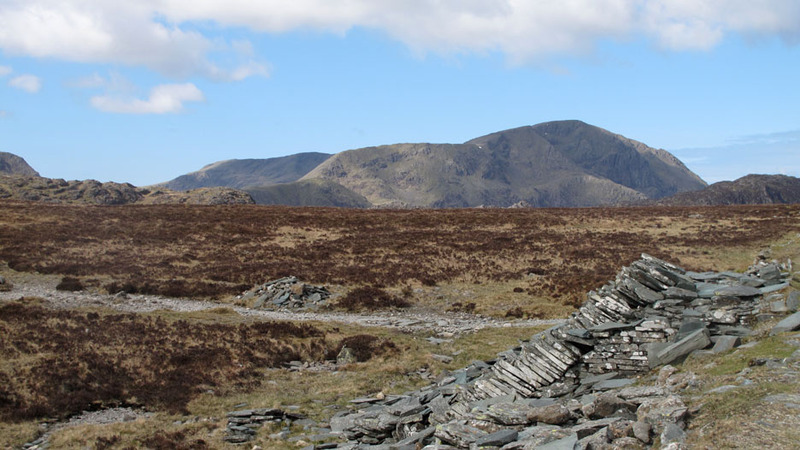 They are separated by Haystacks and the High Stile Ridge. 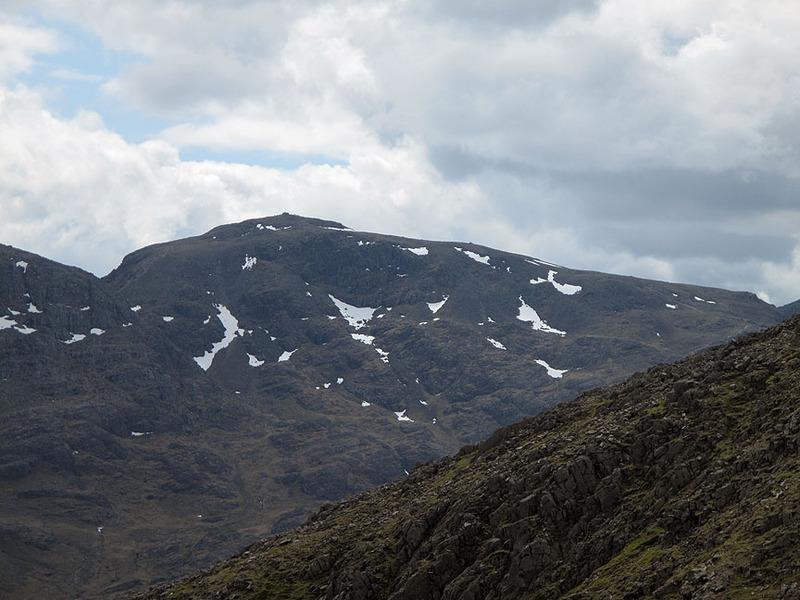 Our route ahead . 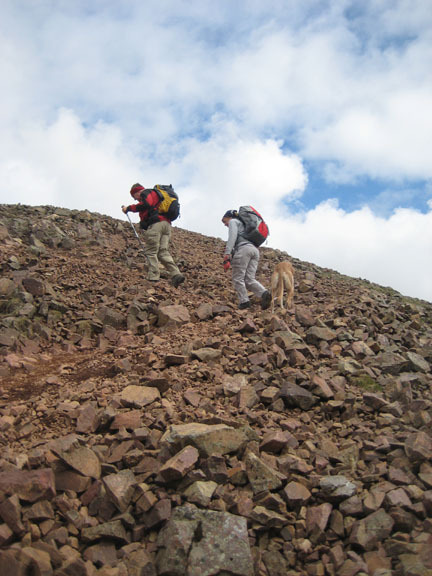 . .
(the lower of the two peaks) via Windy Gap. 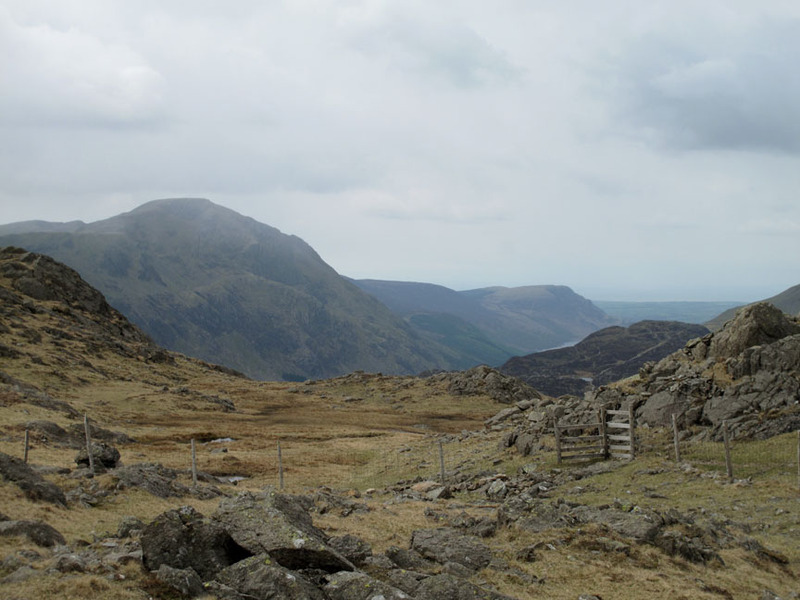 Looking across to the outcrop of Pillar Rock which stands clear of the main part of Pillar Fell. Zooming in . 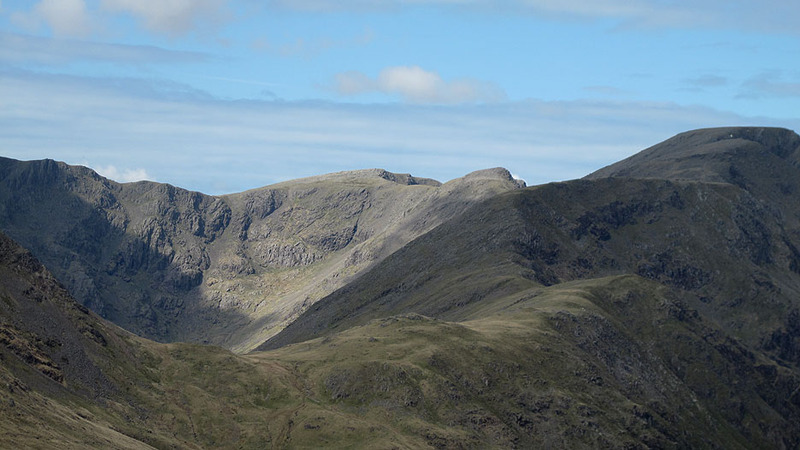 . . there's Wasdale's Red Pike, Scoat Fell, Black Crag and the rounded top of Pillar. 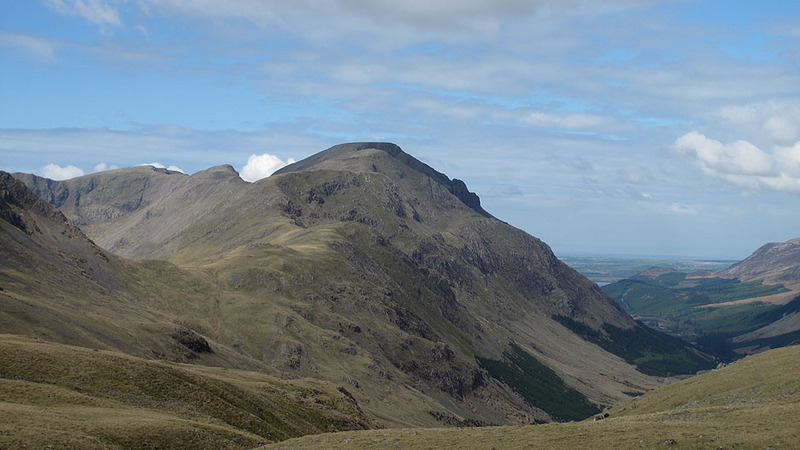 Gable Crags with two tiny patches of snow, one at the top, one at the bottom. 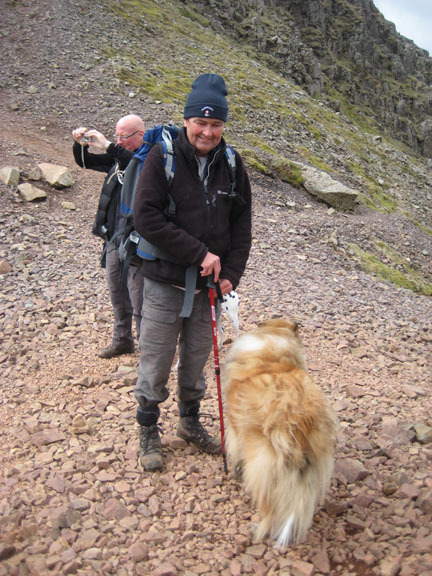 Ann walks with Stephen and Jake who have been great company all along the Trod. Time to strike up towards Windy Gap leaving the main path to continue on. so the path does not become well defined until the valley narrows further up. 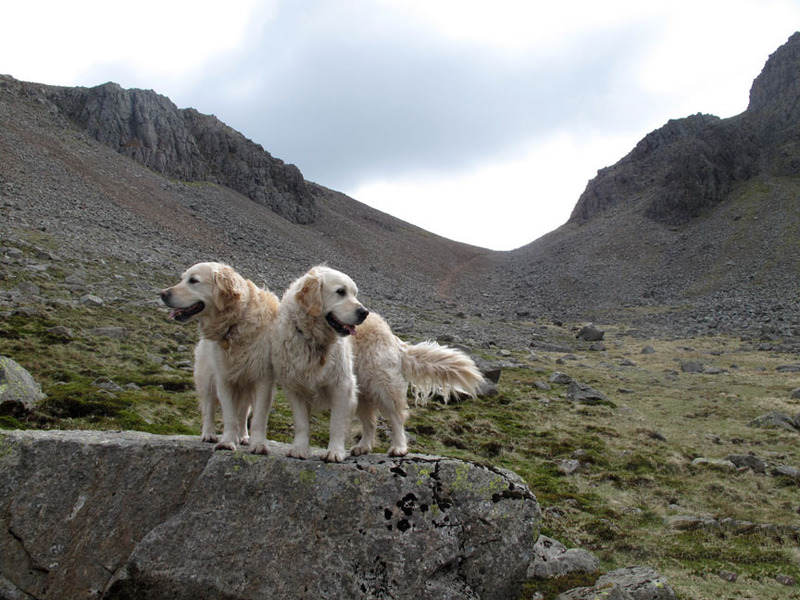 Harry and Bethan jump up onto a rock for a photo opportunity. Smile please . . . and try both looking the same direction at the same time ! Jake also poses for Stephen (and Ann) to take his photo. 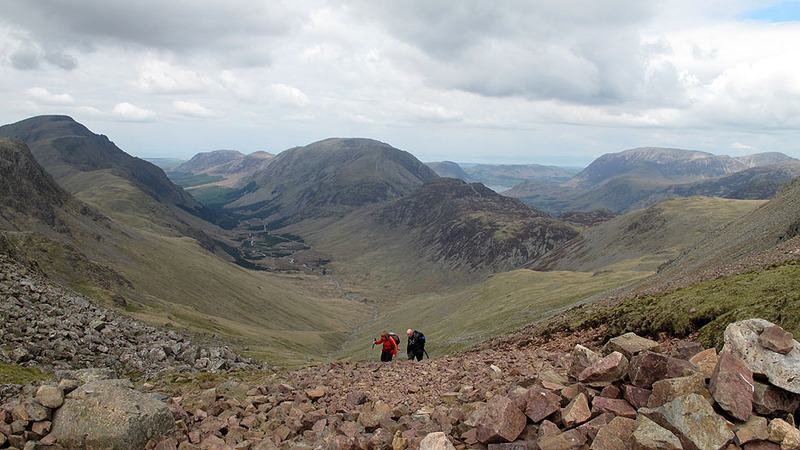 We leave Ennerdale behind as we climb . . .
. . . using the well defined but rather loose scree path. 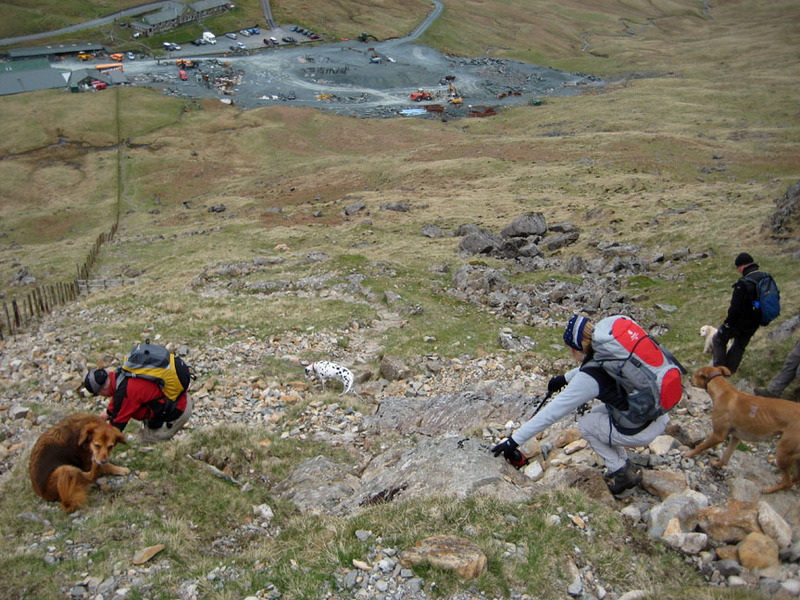 Topping out against the view of the western Lakeland Valleys. Spinning round we get that first and exciting view as we reach the top of the pass. At Windy Gap Stephen heads off for Great Gable . . .
. . . but we take the path up the opposite way. 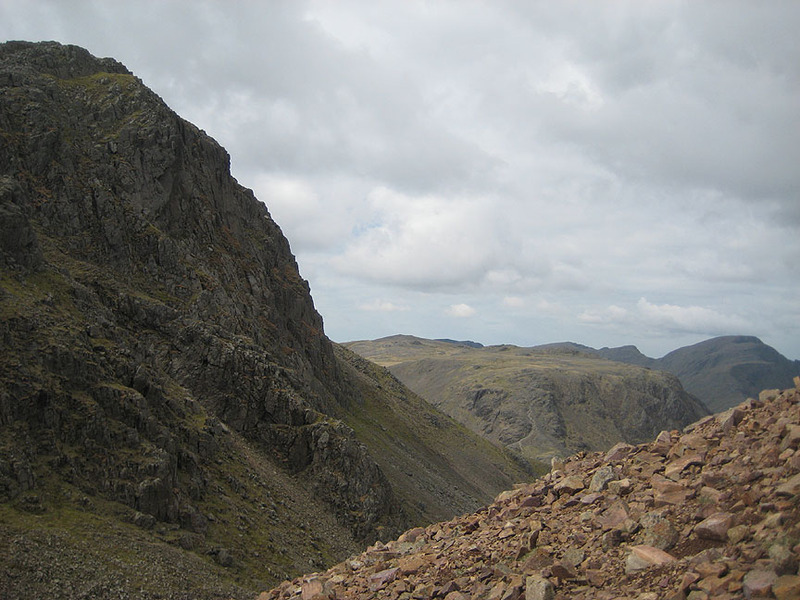 Climbing up to Green Gable we get close views across to the Gable Crags again. 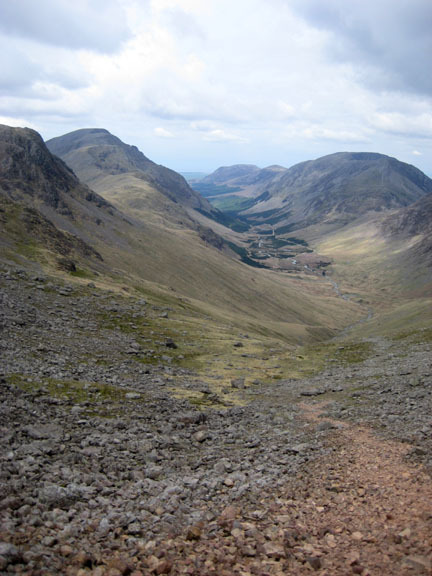 Looking down the Aaron Slack path to Styhead Tarn . . .
. . . and across to the highest point in England, Scafell Pike. Look closely . 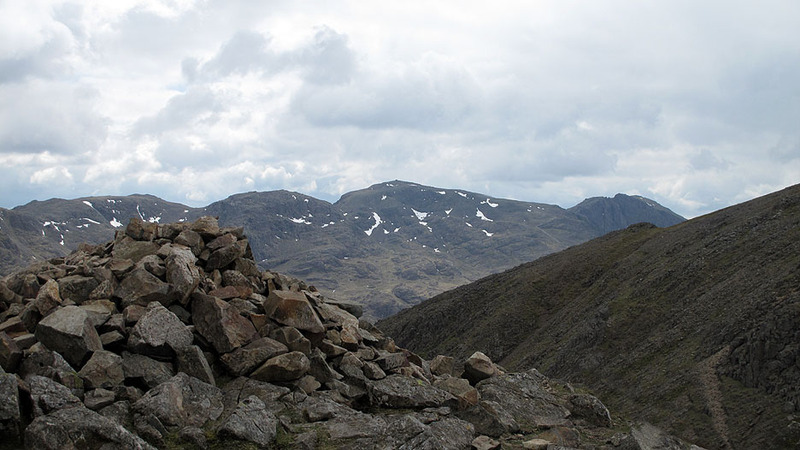 . . you can even see a few people on the top next to the large cairn. 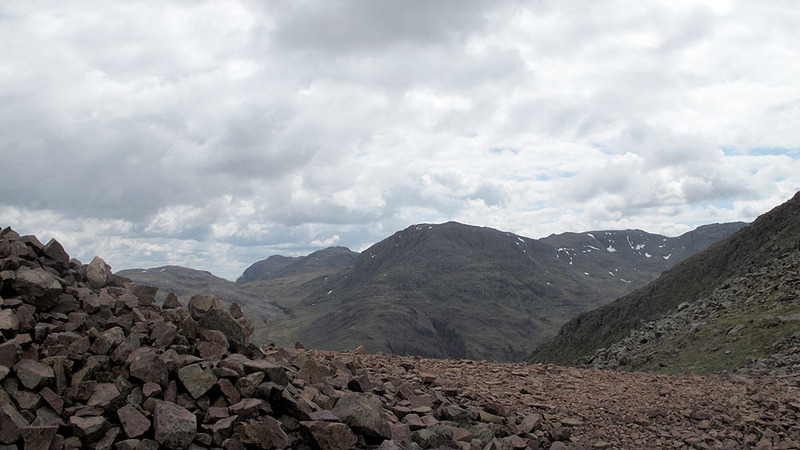 From the top of Green Gable we get a full panorama of the Scafell range. 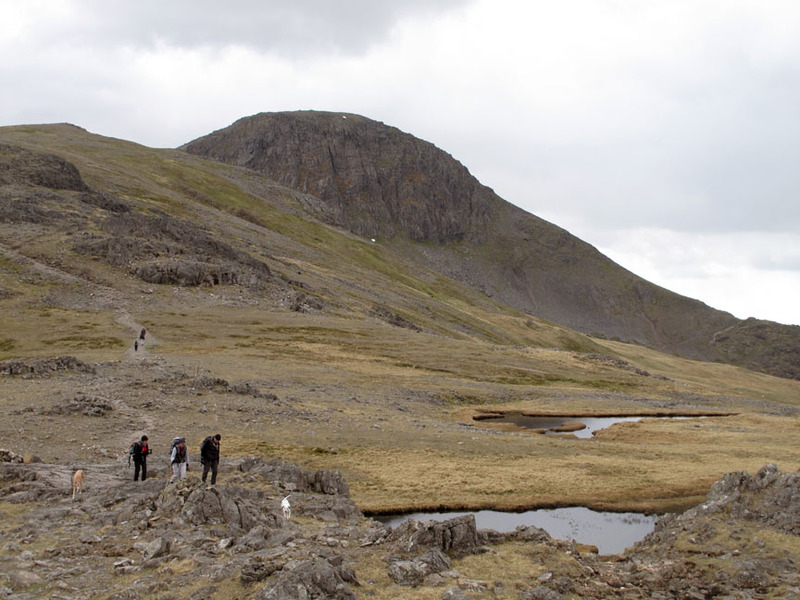 Great End, Ill Crag, Broad Crag, Scafell Pike and Scafell. Looking the other way we can see Scotland above Low Fell at the far end of the valley. 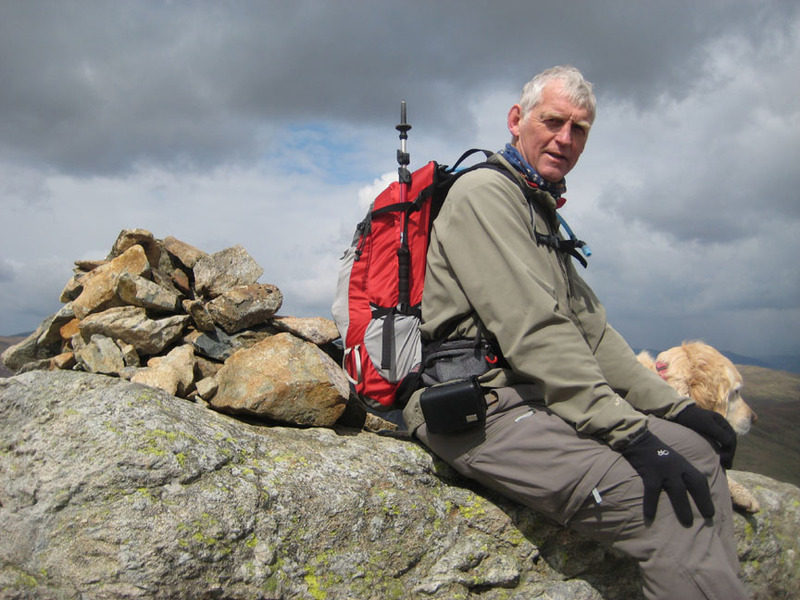 Imperceptibly the blue skies have faded to grey and up here there's a keen breeze. 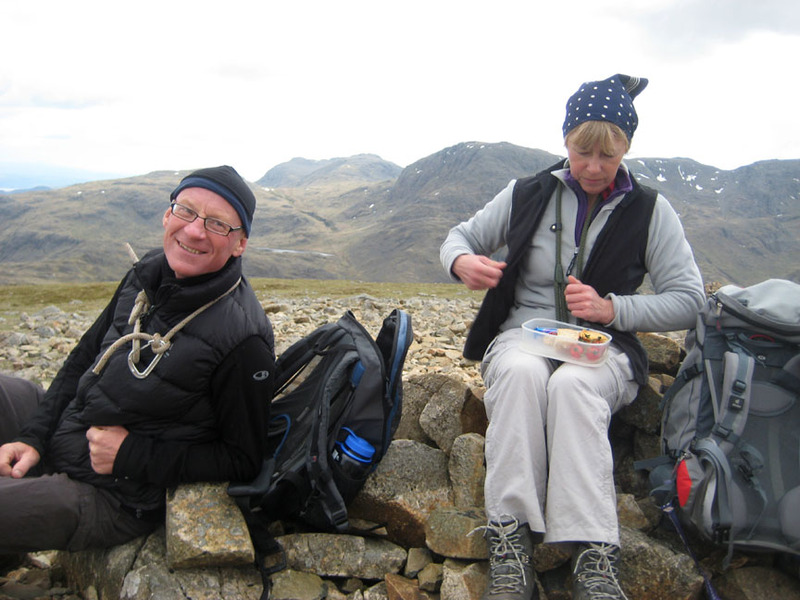 We tuck ourselves into one of the summit shelters for a spot of lunch. It's not that he doesn't eat . . . Hilton is just a bit slow at getting his sandwiches out. Harry is not so keen to be in this one ! It looks like John is trying to " Pull Start " Jo . . . in order to get the group on the move again. On our way . . . it's down hill most of the way from here. 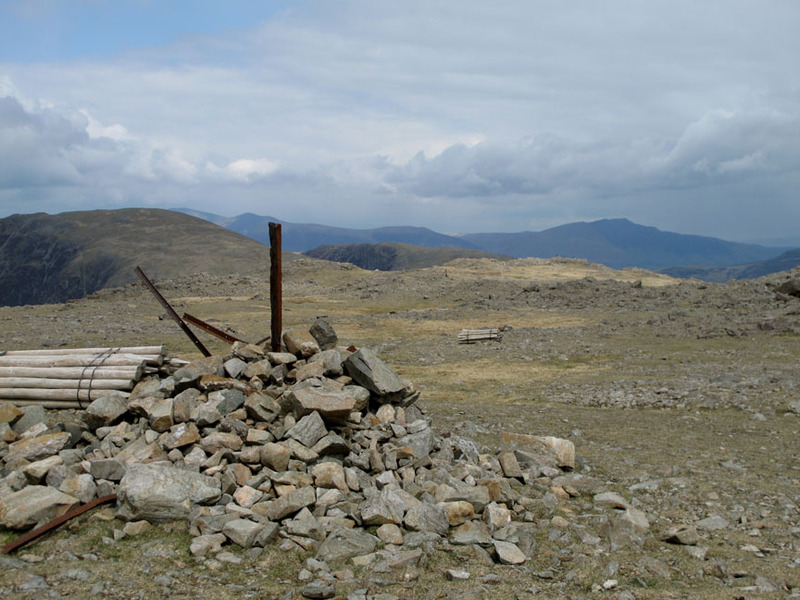 We follow the cairns and old fence posts north west from Green Gable. 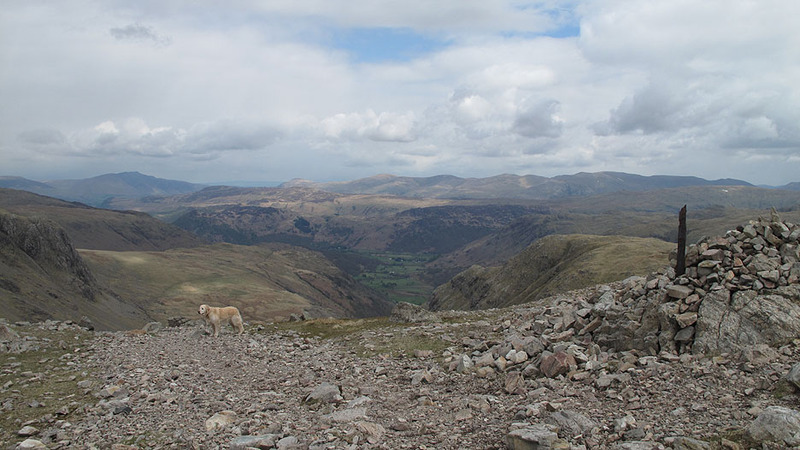 Ahead is the green of the Borrowdale Valley, with Blencathra to the left and the Helvellyn Range to the centre and right. 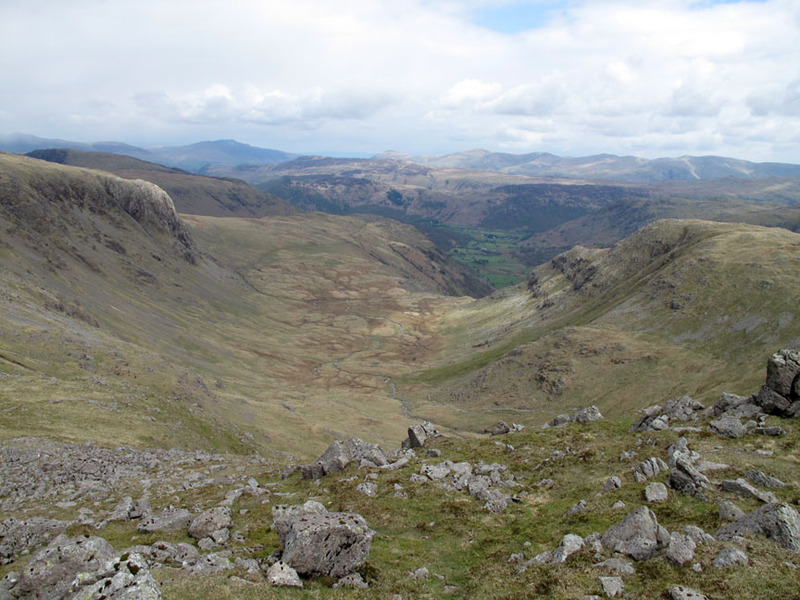 Sun shining on the raised valley of Gillercombe that leads down to Seathwaite via Sour Milk Gill. 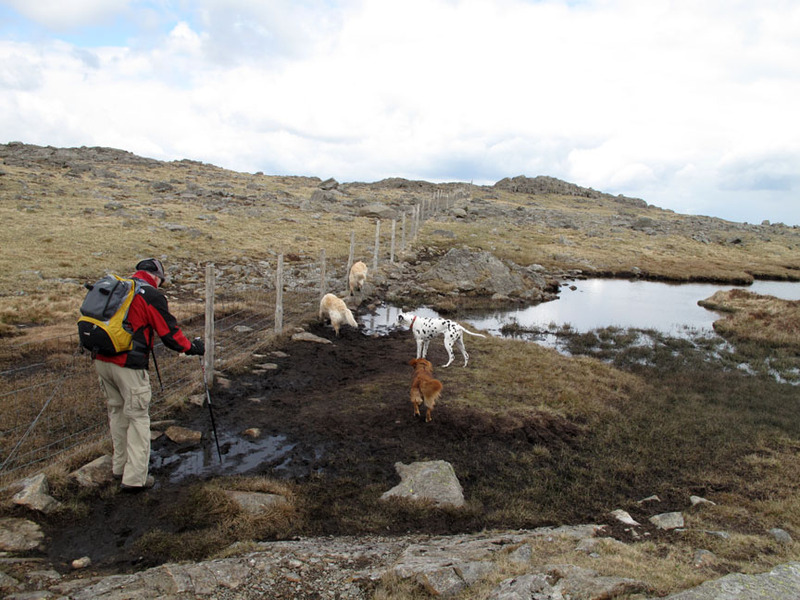 The dogs are first to the Brandreth Tarns. Time for a dip despite the temperature. 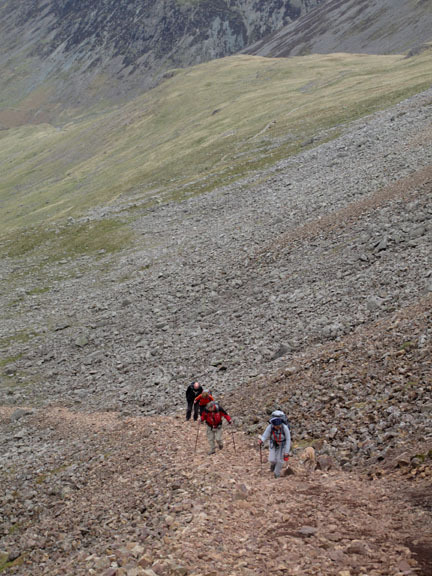 Looking back at Great Gable we start our last climb, up towards Brandreth. 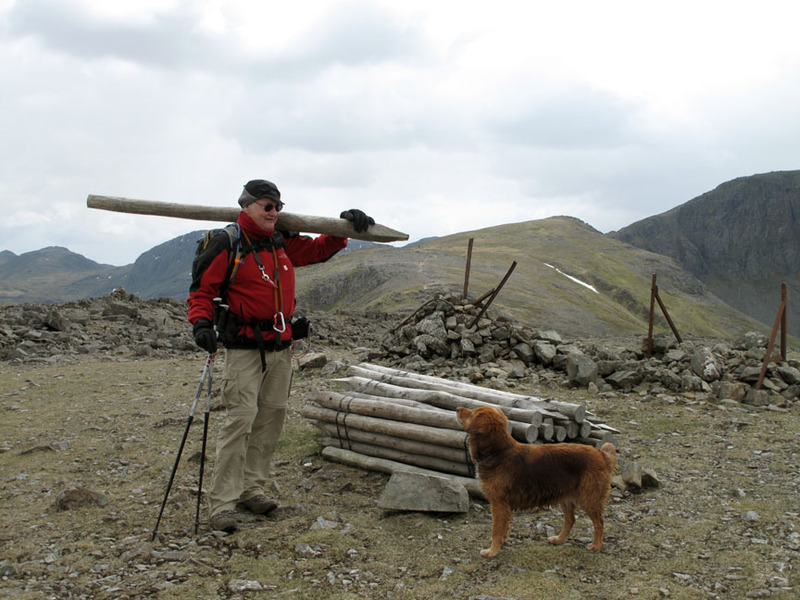 The old iron post was never replaced when they brought up the fence post after Foot and Mouth. In fact they never built the fence at all, and the stakes remain un-used. John fancied taking one home. 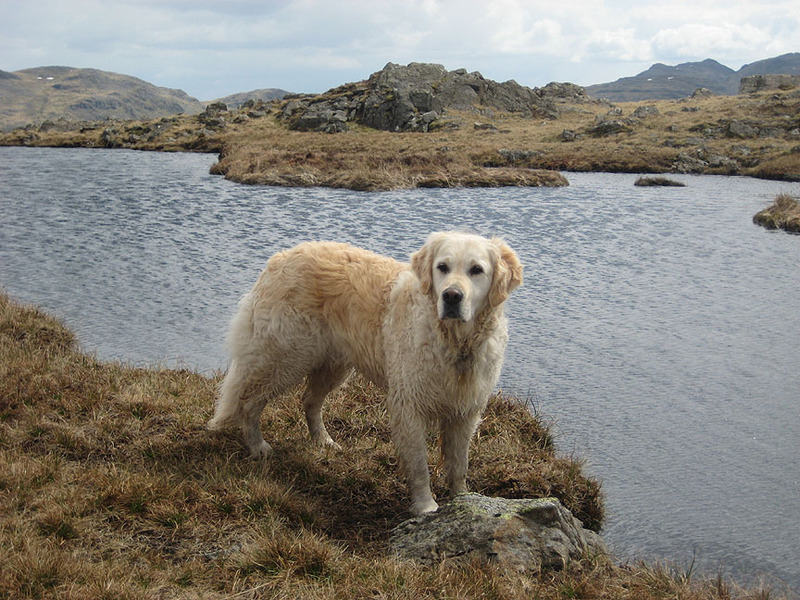 The dry weather of recent weeks made the ridge walk and the peat bog easier to cross . . .
. . . but there had been sufficient rain over the winter to ensure a swim for Harry. 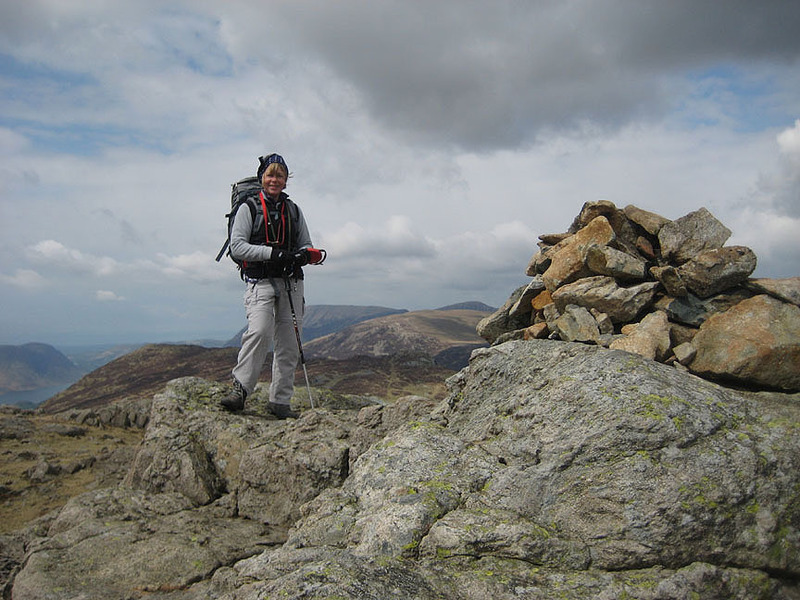 Jo at Grey Knotts summit . . . head scarf and gloves to mitigate the effect of the breeze. By giving Ann her own camera you unfortunately get more photos of me ! It's bright despite the high clouds, but a brief wintery shower blows across the Ennerdale Valley. One of several in the area . . . but fortunately they all missed us. 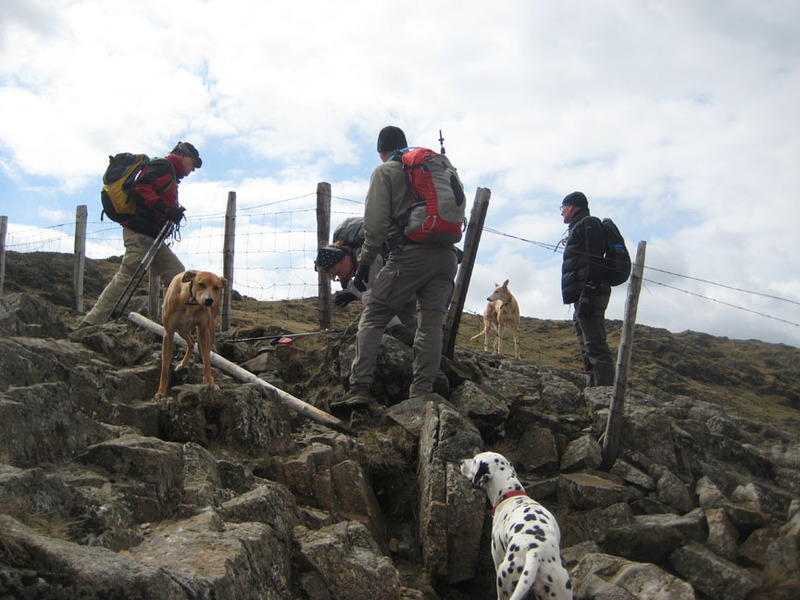 We could have used the stile further up . . .
but as you can see, the fence has rusted away and a convenient gap presents itself. On the right side now for the track down . . .
. . . which dives down a short but interesting gully. Care needed with all the loose stones. 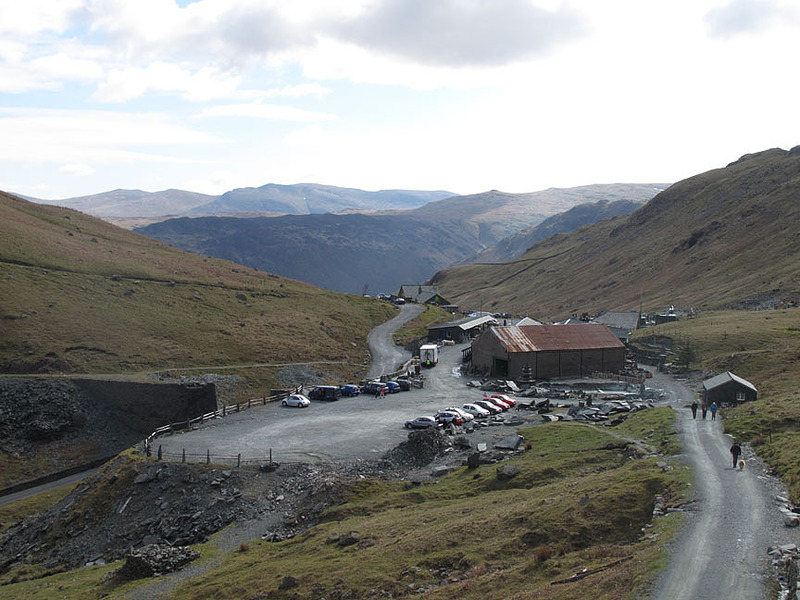 The pitched path will take us down the last part of the way to the car park below. 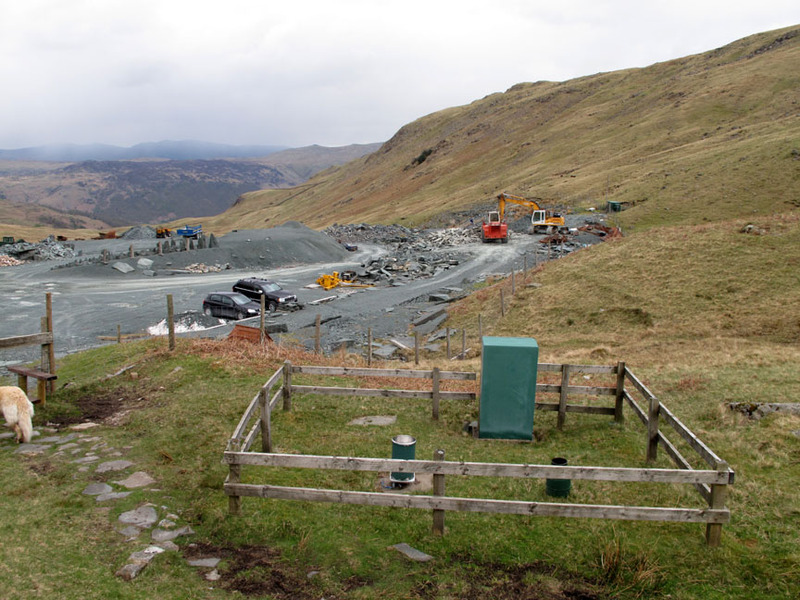 The Honister rain gauges and weather station just before we cross into the mine complex. All that's missing is the familiar green helicopter. Don't talk too soon . . . here it comes. seems unperturbed by the arrival of ourselves, our dogs or the Boss in his whirlybird. Mmmm . 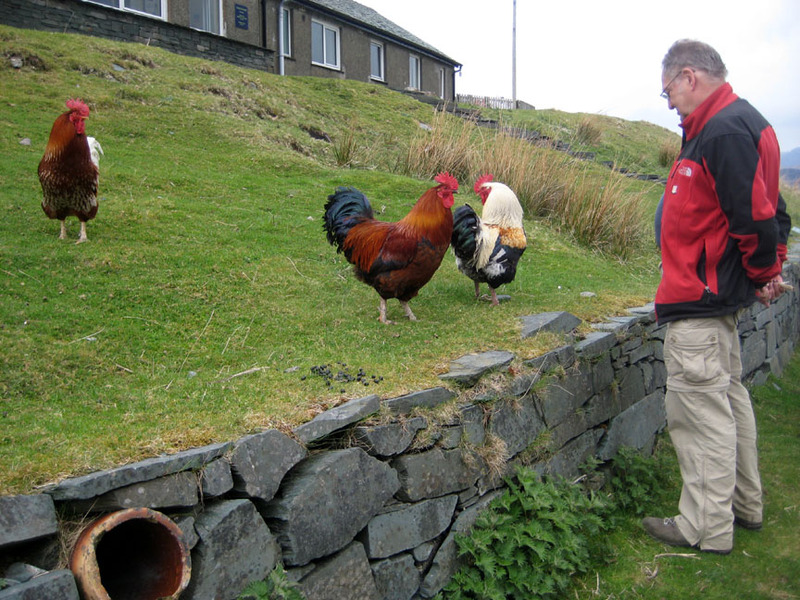 . . John and the other Honister fowl have a staring competition. 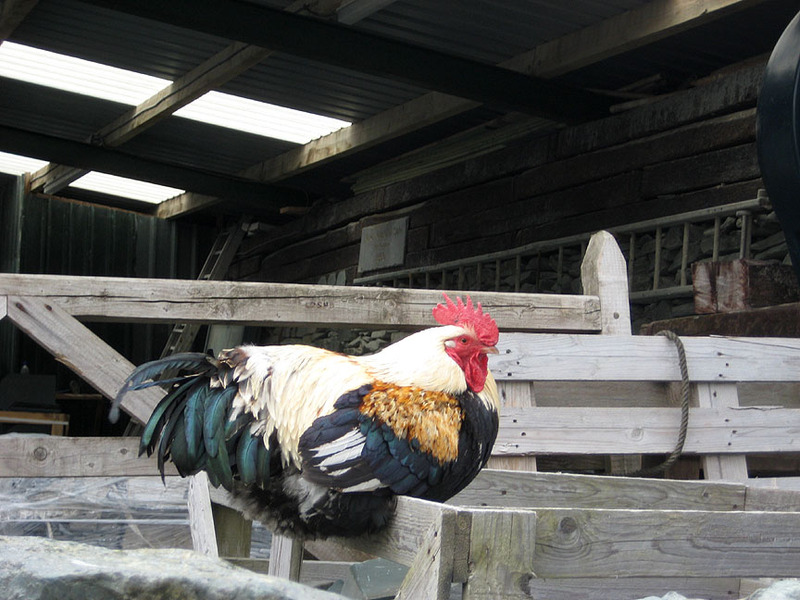 First one to blink is a chicken ! This site best viewed with . 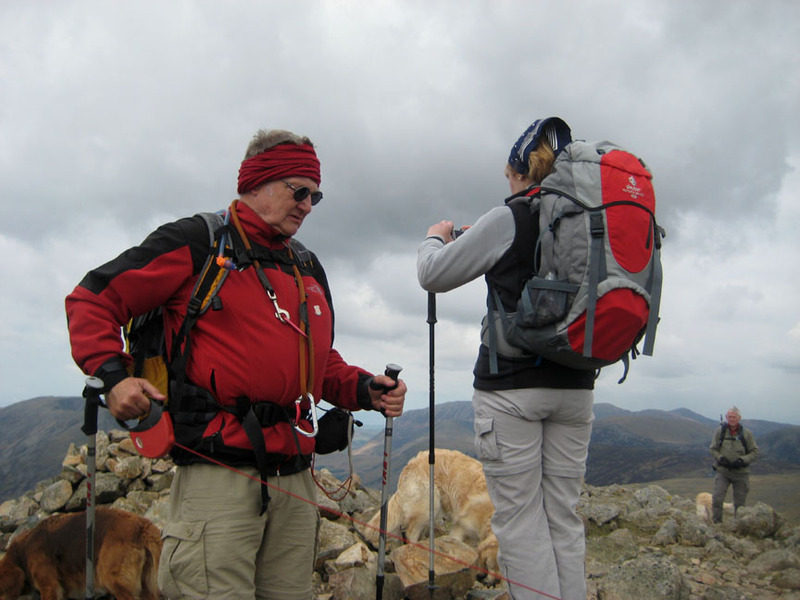 . . post walk refreshments at the Sky High Cafe.